Contact us to begin a conversation about how we can partner with you! Welcome to iOSComponents! 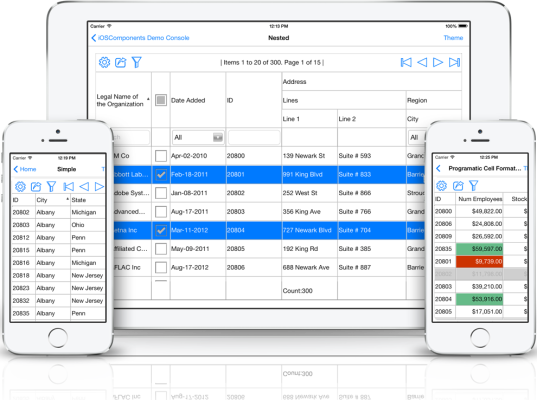 We provide fully functional, robust, tested and ready to use custom iOS controls, including the iOS DataGrid - the most powerful DataGrid available for iOS Apps as well as a suite of utility controls including Auto complete text input, Combo box, Date Combo box, Check box, Radio button, Check box list, Multi select combo box and more! Turbo charge your iPhone and iPad applications today!! Tree grids/sub grids and a LOT MORE!